MSI has announced its entry into the burgeoning tablet PC market at this week's Computex event in Taipei, with the launch of the new MSI WindPad. 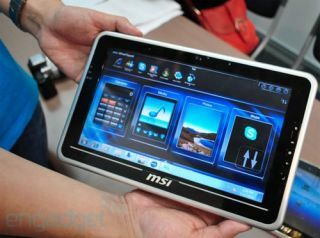 MSI's first device in the tablet category is the WindPad 100, which is a low-cost Intel Atom Z530-powered slate PC running Window 7. MSI has also created its own Wind Touch UI layer for the device, although we expect most users will quickly revert to the familiarity of Windows 7. The WindPad will also have two USB ports, a very hand HDMI output for hooking it up and outputting 720p video to your HD TV and an integrated webcam.